If you’re looking to build a gaming rig or if you’re planning to upgrade your RAM soon, chances are you’ve noticed the spike in prices. What really caused the ruckus? We’ll cover the bits and pieces to give you an idea what’s causing it as well as give you tips on what you can do to get the best prices when buying a RAM. Is it Because of Crypto Mining? The reason why prices have gone up isn’t related to the dreaded GPU shortage. Rather, it’s similar to how SSD prices have gone up, which we’ll cover in great detail shortly. The rise of crypto mining has nothing to do with the RAM price increase. You don’t need a lot of RAM to mine coins. In fact, crypto miners back in the days are usually fine with 8GB of RAM with some cutting the cost of building a mining machine by getting at least 4GB. The initially reported increase in RAM prices can be traced back to August 31st, 2016. The price of a 16GB DDR4 RAM had risen from about $50 to over $64 by the end of the same month. Since then, prices have gone through the roof and never ceased to stop. This continued throughout 2017, then finally reaching its peak in January and February last year. During these times, a 16GB DDR4 RAM cost more or less $200 from $50. Fortunately, prices have consistently dropped since. Judging from the price history and graphs you would find at PCPartPicker and CamelCamelCamel, it’s likely that prices will continue to drop throughout 2019. It was clear that Crypto mining was not the culprit. Rather, it’s the server and mobile RAMs on smartphones and Android phones that led the increased demand. The demand was high during these times when a DRAM manufacturer, Samsung, had problems with power outages during the first half of last year. This led to a destruction of 3.5% of the global NAND flash output for March alone (due to damaged silicon wafers used to make the memory chips). Because of this, the demand to produce DRAM was slightly put to one side to cope with the loss. To make things even worse, new phones, especially iPhones and Samsung phones are making a switch from using the DDR3 technology over to the newer DDR4 RAM technology. It took some time to finally see a drop in price because the smartphone market is considered a higher priority than the PC market. But prices have dropped since last year with the supply steadily catching up with the demand. In fact, the price of a 16GB DDR4 RAM this first quarter of 2019 is now around $125. What’s with the DDR4 Technology? The difference isn’t that big. 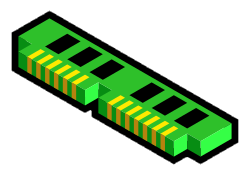 Aside from the different physical design of modules, or dual in-line memory module (DIMM), DDR4 operates at a slightly lower voltage than DDR3. DDR4 RAMs run at 1.2 volts, down from DDR3’s 1.5 volts. This doesn’t seem big from a home user's perspective but for manufacturers, companies, and server farms with thousands of RAMs, this adds up. Also, DDR4 RAM rated speeds are faster than its predecessor. The rated speed ranges on DDR3 memory are now commonly between 1066MHz-2133MHz, compared to 2133MHz-4133MHz on the newer DDR4 technology. To learn more about RAM rated speeds see this article on faster RAM at WePC. Both technologies differ in other areas, too, such as their electronic design or engineering, as well as extra programmable latencies and potential adjustments. Although RAM speeds have moved on since this AnandTech 2015 article, it has an in-depth technical comparison between DDR3 and DDR4 ram differences if you want to see charts and comparison benchmarks (to help understand the technical differences between DDR3 and DDR4). Generally, the DDR4 technology holds a better price-to-performance ratio than its predecessor. This makes it an ideal choice for new mobile phones to meet the demands of today’s applications and mobile programs. When is the Best Time to Buy RAM? If you’re planning to build a new system in 2019, you’re in luck. Prices have consistently toned down since last year. They may still not be as cheap as they originally were but the drop is significant enough to consider buying one an alright decision. It’s unlikely that prices are going to go back up considering how production has slowly been able to cope with the market’s demands. But even so, anything could happen from here on, so the best time to buy RAM is anytime... at the moment, that is. Based on the above statement, it’s not easy to say that we could predict 100% of what’s to happen in the RAM industry this year. But the graphs from PCPartpicker and CamelCamelCamel are strong indications that prices will continue to drop throughout this year. Overall, prices now are fine for what they are. So, if you’re planning to buy RAM, it’s safe to say that you’re not going to lose more than builders who purchased RAMs exactly a year ago. Because even if prices do continue to roll back, it will be unlikely that it will go back to its original price by the end of the year. But who knows?